Stretching some 375 kilometres along Croatia’s dramatic Adriatic coast, Dalmatia is a treasure trove of picturesque towns, secluded bays, lush natural wilderness, Roman ruins and beautiful offshore islands. At the heart of the region is the bustling city of Split, home to numerous archaeological, historical and cultural monuments, plus an excellent starting point from which to discover all that Dalmatia has to offer.And offer is realy huge, numerous larger and smaller islands with their archipelago, from Drvenik Veli and Mali in the north and the area south of Split also contains numerous islands, the largest of which include Brac, Hvar, Vis, Korcula, Mljet, and Lastovo. 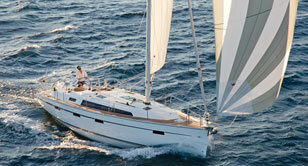 Modern marinas and organized waterfront moorings are availble in a number of towns. Natural, deep in land recessed bays and coves serve as ideal anchorages, and in some of them you can find mooring buoys. Someplace you can moore your boat to a small pier in front of the restaurant, which is considered you will have dinner there. 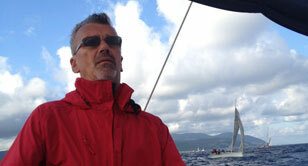 Adriatic sea is generally quite safe and convenient area for sailing. Appropriate number of marinas, town ports and organized anchorages will make your charter cruise easygoing and comfortable. No matter if you seek for quiet and unspoilt natural spots where you could relax in maximum privacy, or you want to explore bustling streets of charming towns, you would find it all there. As a cold wind, Bura vertically descends the slopes of the coastal mountains and moving towards the sea. It thus creates dust clouds that reduce visibility. Bura is announced by a “cap” of clouds that seem as though they have grabbed the high mountain peaks – Velebit in the north Adriatic, Mosor and Biokovo in the south Adriatic. It rarely blows for more than three days. When Bura is of local origin, it will blow itself out in less than a day. Since it brings cold and heavy air, it finds its way towards the sea through mountain faults and between higher mountain ranges. Bura blows in gusts and therefore might be very severe and unexpected, so, if you have not encountered Bura so far, we advise you to reach the nearest harbor. The areas where some of the strongest Bura winds occur are: Trieste Bay, Velebit channel famous for the Bura of Senj, Vinodolski channel, Bay of Novigrad, areas around Sibenik, Split (in particular Vrulja near Omiš), Makarska – lowlands of Biokovo, Zuljan Bay on the Pelješac peninsula, River Neretva estuary, Risan Bay in Boka. On the contrary, areas where some of the mildest Bura winds occur are: western coast of Istria, southern area of Biokovo stretching towards Trogir, from the coast of Poljice to Dugi Rat, as well as the coast of Montenegro. In short, it might be said that where coastal hilltops are lower than 600 meters or more than 4 kilometers from the coast, the mildest Bura winds occur. Jugo is a south-easterly wind. It blows across the Adriatic when a cyclone develops over the Adriatic area. It brings clouds and rain. The air pressure drops. It develops slowly and it can usually be noticed two or three days in advance. It usually lasts longer than Bura, five to seven days, and even longer in winter. There is a possibility of the so called dry Jugo, when it blows for a couple of days without bringing rain. Unlike Bura, Jugo is a constant wind that gradually gains strength. Mistral is a “benevolent”, a friendly wind looked forward by especially sailors and all those who enjoy the summer season under its breeze. Mistral is a daily wind blowing from the northwest and created by the differences in temperature between the mainland and sea. It is fairly frequent from spring to autumn and strongest in July and August. It usually starts blowing around 9 or 10 in the morning, reaches its highest strength in the afternoon and fades at sunset. Mistral is generally weaker in the north Adriatic than in its south. Tramuntana is a classical name for a northern wind. The word derived from Latin vertus transmontanus – a wind that blows (comes) across the mountains. This name for a northern wind is widely used throughout the Mediterranean. It is a cold wind of moderate strength (sometimes strong gusts), that usually forms in clear weather. Its appearance announces nice weather. The Levanter refers to an easterly wind. The name comes from Italian levante meaning east, whereas the word developed from Latin levare: uplift, elevate. It is often a moderate (rarely strong) wind, carrying clouds, moisture and precipitation. When it reaches high intensity, it is described as Levanter. Ostro is a common name for a southerly wind. Its name is derived from Latin auster: south. It is described as a warm and humid wind that usually does not last long, but it might reach considerable strength. As local people would say: “Slabo ostro je lostrin, a jako lostracina”/ Ostro is weak as well as strong. Libeccio is a south-westerly Adriatic wind described both as lebic and garbin. It is usually a dry and warm wind, which rises across the Adriatic after Jugo, when the Mediterranean cyclone arriving from the sea reaches the western and central coast of Croatia. It usually does not last long, but it might give violent squalls (lebicada). It is especially dangerous because of wave “crossing” and rising of the sea surface in shallow harbors that are open to the south-west. Garbin, grbin, garbinada (from Arab gharbi) is a very strong, sudden and short-lived south-westerly (or westerly south-westerly) wind. It can cause muddy waters, in case of sand or gravel beaches. 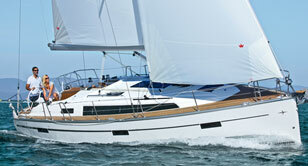 During the summer season weather conditions in the Adriatic are generally very favorable for boating. This applies for period from June to September, when the weather is mostly sunny and warm and sea water temperature is more than suitable for swimming. Charter season actually starts in April and ends in November, when temperatures may vary significantly, while there is still enough nice weather suitable for cruising, but swimming is more exception than rule. Generally, weather conditions are slightly more favourable when heading south. Air temperature in the summer mostly ranges from 25 to 35 degrees Celsius. During the shoulder season temperatures vary from around 15 to 25 degrees Celsius, but if it is sunny day, which is often, you may have a feeling of even higher temperature. Temperature of sea water in the summer ranges from 15 to about 25 degrees Celsius, sometimes even more, while lower values than mentioned occur only in the winter. Water temperature also varies quite a lot depending on the weather and microlocation.